Tue, 12 Nov 2013 | Published in I Was There . . . 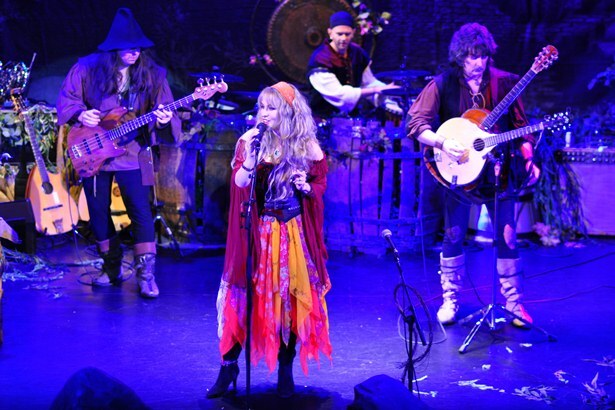 Sometimes perfect nights do happen: a great venue (in this case the South Orange Performing Arts Center in South Orange N.J.) hosted a wonderful band, Blackmore’s Night, and I was there. Keyboard player “David of Larchmont,” female backing vocalist/French horn player “Lady” Kelly DeWinter, “The Scarlet Fiddler,” violin player, bass player “Earl Grey of Chimay” and drummer/percussionist “Troubadour of Aberdeen” with musical leader and rock-guitar God Ritchie Blackmore opened with the title track to their latest release Dancer and the Moon as lead vocalist Candice Night twirled out in her many layered dress and long blonde locks to kick the night into perfect high gear. The early medley of “Play Minstrel Play/Somewhere Over The Sea/Queen For A Day Part II” wove a rich tapestry of surprisingly heavy sound from this band retelling Renaissance classics, producing commercially viable originals and taking on the cannon of Blackmore’s ex rock tunes. The band managed to do just that when early on they tackled Deep Purple’s “Soldier Of Fortune” with an amazing Ritchie acoustic solo upfront. This is a band that just exudes high good spirit: Candice jokes with hubby Ritchie, poking fun over his rumored bad boy rock- and-roll past; the players jam, take solos (as prompted by leader Ritchie) smile and cavort; there was many a high swirling moment that conjured a ‘Ren fare’ feel delighting the first few rows of revelers dressed in full Renaissance garb. “Durch den Wald zum Bach Haus” included Larmont’s silly vocal on a snippet of “Hava Nagila;” the afore mentioned first few rows shouted to the spirited “All the Fun of the Fayre,” and Candice stole Joan Baez’s “Diamonds & Rust” with her perfect pitch. Ritchie grabbed an electric guitar for amazing trills and hammer-offs during the last quarter of the show and the band ran through an excellent, break-neck medley. Candice finally sweetly sang “Barbara Allen” to end the regular set. Between the truly inspired stage set of fake wooden proscenium and cut-out like village silhouette screen behind them, the costuming and of course the sound in such a perfect acoustic setting, I’d say Blackmore’s Night at SOPAC was one of the best shows I have seen all year.